From January 14 to 18 will take place the 19th version of the International Festival of Contemporary Music of the Universidad de Chile. 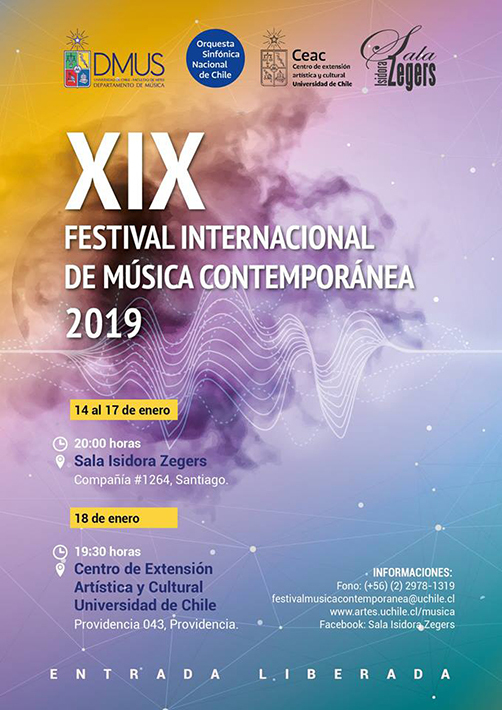 The 19th International Festival of Contemporary Music will be held between January 14 and 18, 2019. The first four days will be at 20:00 in the Isidora Zegers Room, while the final day is scheduled for Friday, January 18 at 7:30 p.m. in the Theater of the University of Chile. Festival has free entry. The 2019 version will be under the direction of the composer, pianist and academic of the Department of Music (DMUS), Jorge Pepi, who has wanted to stamp the event that seeks to establish a tradition of contemporary music, giving an account of the genre’s referents, as well as new creations. That is why a tribute will be made to the composer Leni Alexander; a space called The dawn of modernity, which includes the execution of pieces by composers Claude Debussy, Igor Stravinsky, Charles Ives and Arnold Schöenberg; the Debussy Project, by the DMUS Ensamble; as well as space for large ensembles, chamber ensembles, soloists and works by young composers. As is tradition, everything will close with the presentation of the National Symphony Orchestra of Chile on Friday, January 18 at the Theater of the University of Chile.